[SOLVED] Unable To Connect To NVidia Error - Full Guide! 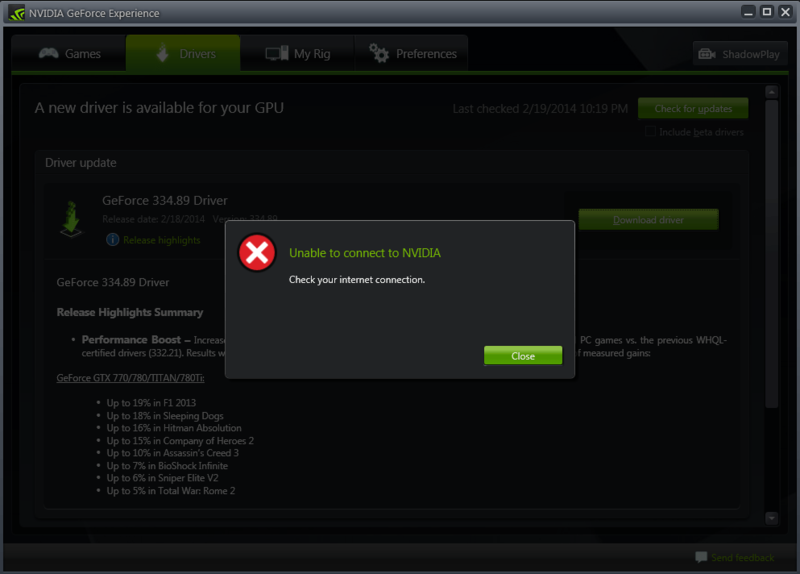 [SOLVED] Unable To Connect To NVidia Error – Full Guide! So whenever I start GeForce experience I get an unable to connect to NVidia error but then the program window will pop up anyways, likewise, I am unable to download any new updates to drivers with a similar error. Any progress on this issue? So, first, we need to understand why this error occurs. In simple words, the Network Service of NVidia freezes in the ‘Starting’ status due to which the ‘Unable To Connect To NVidia’ Error Occurs. How we came to know this? Well, if you are facing this error, just press ‘Windows + R’ key and a pop-up will appear where you need to write ‘services.msc.’ Here, you will see that the NVidia Network Service is stuck in the ‘Starting’ Status. Now, since we are aware of how the error occurs, let’s talk about the steps to fix this error. READ: [FIX] SAFETYNET FAILED: CTS PROFILE MISMATCH ERRORS – FULL GUIDE! When you are in the ‘Net Service’ Folder, you need to either Rename or Delete the ‘NSManagedTasks.xml.’ file. The chances are that you won’t see this file in the folder at the moment you open it. So, enable the ‘Show Hidden Files’ from the ‘View’ option in the main menu, and you will see this file. Delete this file. Now, you need to start the NVidia Network Service again by going to Services. For this, again press ‘Windows + R’ and then write ‘Services.msc.’ There, find the NVidia Network Service and right-click on it. Here, just select ‘Start’ Option. If you get the GeForce Experience window, exit it and start it again. Hopefully, the ‘Unable To Connect To NVidia’ Error will be fixed, and you can now update it without any error. Click on the ‘Download’ button next to the name and then let is download. This will let you automatically Update the Drivers that are needed to make sure that there is no error while using NVidia Geforce Experience. So, that’s all about the second method. In case this also fails to work, there is still one more method. CHECK OUT – UBLOCK ORIGIN VS ADBLOCK PLUS – WHICH ONE IS BETTER? Now, it is advised that you should make a backup copy of everything written in that file so that if there is any error due to the editing of Hosts file, you can revert it back. Now, save the file, go back and try to open the NVidia Geforce Experience again. Most probably, it is going to work now, and there won’t be any error. Well, these were some steps via which you can fix one of the most annoying errors in NVidia, i.e., ‘Unable To Connect To NVidia Try Again Later‘. If these steps didn’t work, you could try contacting the experts via the ‘NVidia Forum, ‘ and they will surely help you. Well, if these steps worked, do let us know via the comments section. Below, we are attaching a video tutorial that will show you how to Fix this error. Cheers!